From March 2009 through September 2018 — a period encompassing almost 10 years and the aftermath of the Great Financial Crisis — the world’s stock markets performed exceedingly well. Over this period, the global stock market was up 14.3 percent per year while the S&P 500 was up 17.9 percent per year. This means that $1 invested in global stocks grew to $3.60 while $1 invested in the S&P 500 was worth $4.84. Other than the first few years of this period, stock market volatility was also well below its long-term average. This changed swiftly in 2018’s fourth quarter, with global stocks down 12.7 percent and the S&P 500 down 13.5 percent. These bleak returns came with a corresponding uptick in volatility; the quarter saw numerous days with stocks either rising or falling by 2 percent or more. With such a dramatic reversal, we wanted to revisit the stock market’s longer-term properties so we can put its recent movements in broader context, and also reinforce longer-term investment principles that we continue to believe represent the best course of action, or more accurately inaction. 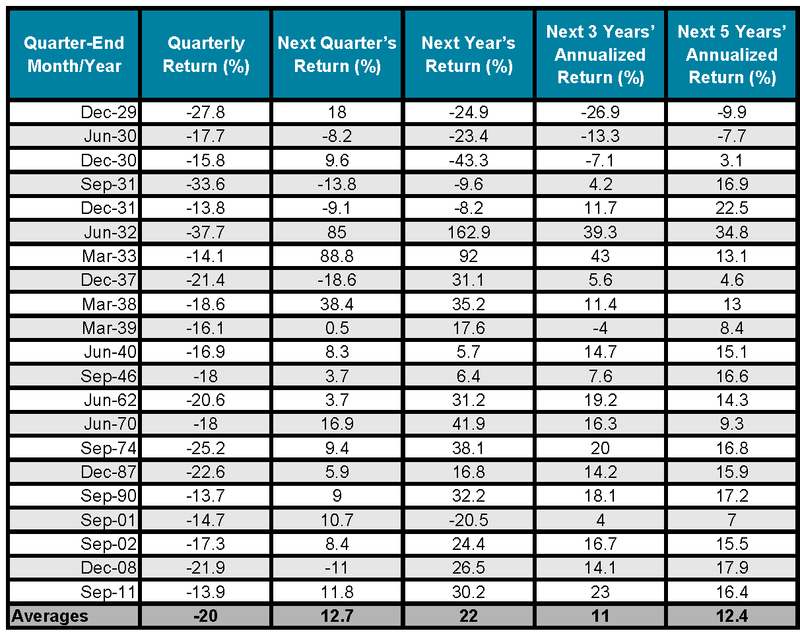 The following table catalogues all the times the S&P 500 has had a quarter equal to or worse than the last quarter of 2018, as well as what happened in periods following that quarter. Performance is historical and does not guarantee future results. Indices are not available for direct investment. Their performance does not reflect the expenses associated with the management of an actual portfolio nor do indices represent results of actual trading. Total return includes reinvestment of dividends and capital gains. Quarters like the fourth quarter of 2018 have happened 21 other times over the history of the U.S. market. So, while relatively rare, they are common enough to be able to draw some conclusions about what tends to happen following such periods. More often than not, stock markets are up over the next quarter, next year, next three years and next five years. This is not a surprise to us. Markets are generally efficient at pricing risk and consequently tend to reward long-term investors for maintaining discipline after quarters of poor stock performance. While risk is, on average, rewarded, there are no guarantees. We can observe some following periods where returns remained negative, even though on balance this is not the case. However, we remain adamant that trying to predict whether or not we will see poor performance continue, in this particular instance and others, is not a sound long-term investment strategy. Markets are notoriously difficult to predict. Thinking back, there is an extremely wide range of circumstances, some of which you may recall, that likely contributed to the negative returns in each period. Some combination of poor economic results, political instability, war, trade, excessively high inflation, deflation or other factors were influential in many of these quarters. We say this to caution you against falling into the trap of believing that markets now have to price risks they have never faced before. Markets have existed for centuries and, more often than not, they are more accurate at pricing risk than the vast majority of institutional and individual investors. So, what should a long-term investor do? In most cases, we believe inaction is going to be your best course of action. While markets will likely continue to be volatile in the near term, your comprehensive financial plan is fully cognizant of such an event, incorporating outcomes like 2018’s fourth quarter and an even wider range of possibilities. When might a change to your portfolio make sense? First, if recent market results have materially reduced the likelihood that your long-term plan will achieve your goals, your advisory team may have some adjustments to discuss. Second, if the level of market risk has made you uncomfortable. We call this the “sleep-well” test. Certainly, we never want short-term market results to affect your quality of life, so connect with your advisory team if a discussion might be helpful.